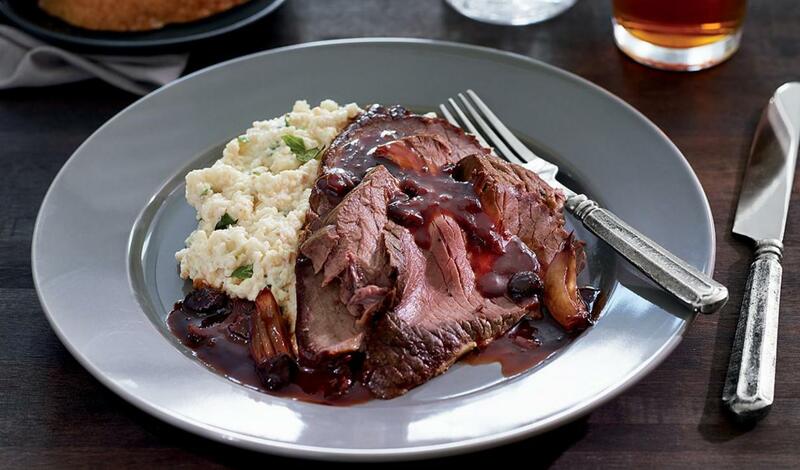 Add a hearty sauce of stout beer, red onions, raisins, cherry marmalade and tomato paste to your Irish braised beef. Pair it with celeriac mash for some authentic flair. Chuck or bottom round roast 6.5 lbs. Buttoned mushrooms, quartered 1 lbs. Carrots, peeled, cut into 2" pieces 1.5 lbs. Red onion, chopped 1 lbs. Leek, white parts only, chopped 1 lbs. Season the beef and sear. In the same pot, add the vegetables and cook until vegetables begin to color. Reduce the heat to medium-low, cover, and sweat. Add the beef, herbs, beer, wine, and prepared beef base and bring to a boil. Reduce to a simmer, cover, and simmer until the beef is tender (about 2 hours). Remove meat and reserve braising liquid. Slice beef. Ladle sticky dark gravy (sub recipe below)over sliced beef. Consider pairing with mashed potatoes or celeriac mash for an authentic flair. Heat the reserved braising liquid. Whisk in the dry Knorr® Demi-Glace Sauce Mix into braising liquid until dissolved. Stir in raisins and cherry preserves and bring sauce to a simmer. Hold hot for service.